New Horizons Band does what the name implies. It brings a new experience to seniors - playing music - and the only requirement is a love for it. That’s what sets it apart from other community bands or orchestras. No auditions are required. No musical degrees are needed. 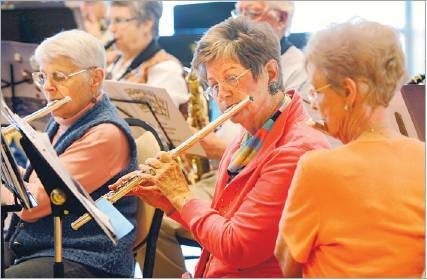 And unlike other local seniors’ musical groups, this one has an international background. Texas is home to seven New Horizons Bands. Four are in North Texas: in Corsicana, Dallas, Denton and Plano. Each is an independent organization and is booked separately for concerts. The New Horizons International Music Association will celebrate 20 years of making music in 2011. From humble beginnings in Rochester, N.Y., the program now boasts more than 175 bands, orchestras, choruses and other ensembles worldwide. "I love it," said Caryn Korshin, a member of the Dallas band, which formed in 1999. "We keep getting better and better." The New Horizons Band of Dallas includes about 60 musicians who rehearse on Fridays in a spacious room at the Carrollton Senior Center. The director, Michael Rossi, seems pleased with his musicians as he conducts with vigor. "They are wonderful," said Rossi, who joined the band in March. "I really enjoy it." He’s fortunate because many members played way back in their high school bands. Music gives them a chance to connect with their past. "It brings back memories," said Linda Knight of Wylie, a retired science teacher. She played the marimba in high school and college. After 40 years of not playing an instrument, she took up the bassoon when she joined New Horizons. "The other plus is everyone is so nice," Knight added. Musician Jim Lawrence agrees. "The friendships are the best part," he said. "Everyone says we are the friendliest group." 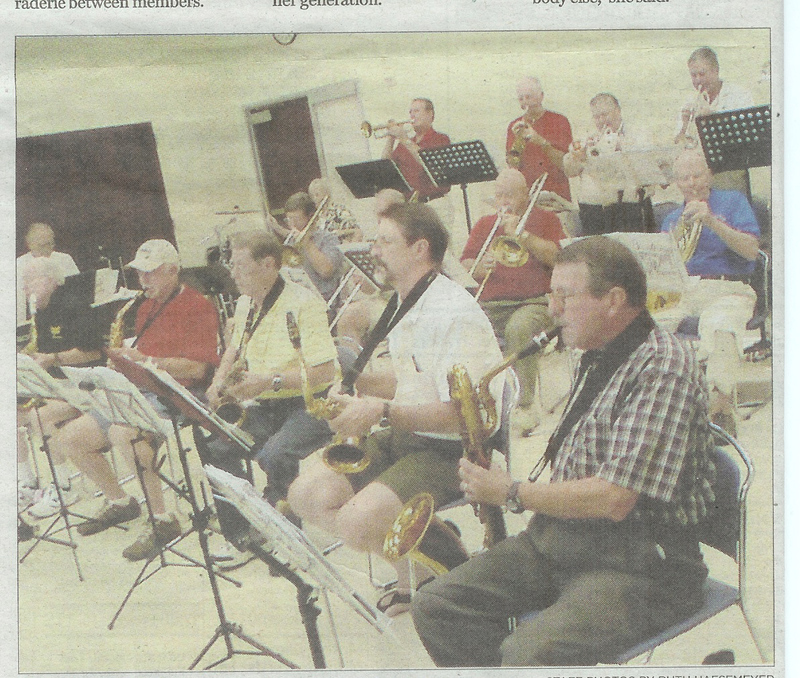 Lawrence picked up the trombone after about 45 years when he joined in the summer of 2009. He heard the band playing in downtown Carrollton and was hooked. "I decided to take the plunge," he said, and he hasn’t looked back. "I like to be able to keep learning and to give back to the community." The band performs at schools, churches, retirement centers, hospitals and conventions. They also play at some private events and around holidays such as Veterans Day and Christmas. "We try to have a concert at least once a month," said Lawrence. "We keep pretty busy year round." New Horizons Band of Dallas also has an Upswing Band, a smaller group that plays jazz, swing, rock and Latin music from the Big Band era. The Denton New Horizons Band started in 1998. Plano New Horizons Band is the newest addition to the area. It formed in May 2010. The other Texas bands are Austin, Houston and Killeen. Lawrence said news about the band spreads mostly by word of mouth. And next year’s anniversary should put the musical group in the limelight. Part of the celebration includes regional tours across the United States and Canada. Tours will run from February through September. To learn more, go to www.newhorizonsmusic.org. Dallas New Horizons Band members Judy Staser (from left), Gloria Cecil, Shirley Howard and other members of the ensemble practiced recently for a Christmas concert. If you venture into the Carrollton Senior Center any Friday afternoon, you will stumble upon the eclectic sounds of the New Horizons Band Dallas. 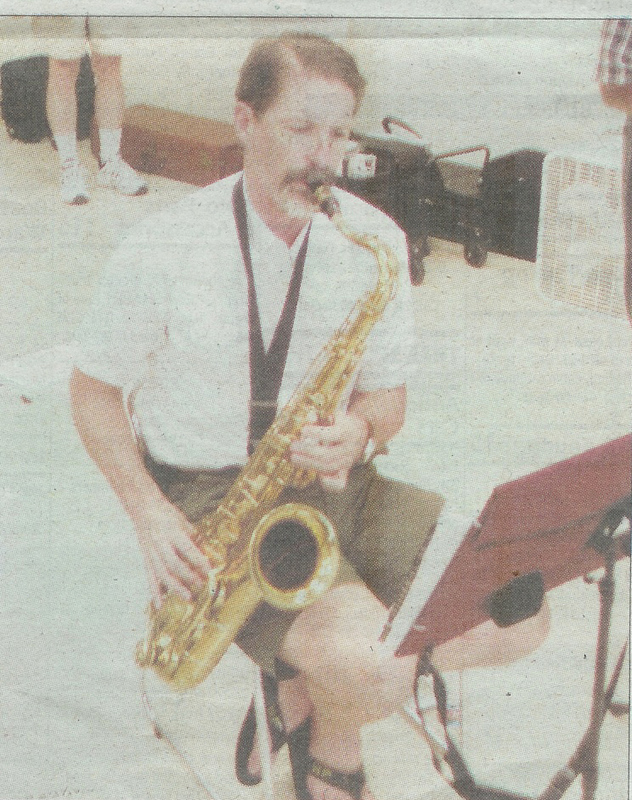 The group practices every Friday at the senior center and welcomes all senior musicians, from beginners to experts. The band is made up of musicians ages 50 and older, and many havent played an instrument since their childhood. Music they perform ranges from patriotic, musicals, love songs and childrens songs. New Horizons Band Dallas includes a concert band and a dance band, Upswing. Both bands have a busy performance schedule and are in high demand. They often perform at schools, churches, retirement centers and other events. Upswings next concert will be Thursday, August 3, at the Richardson Senior Center for National Night Out. 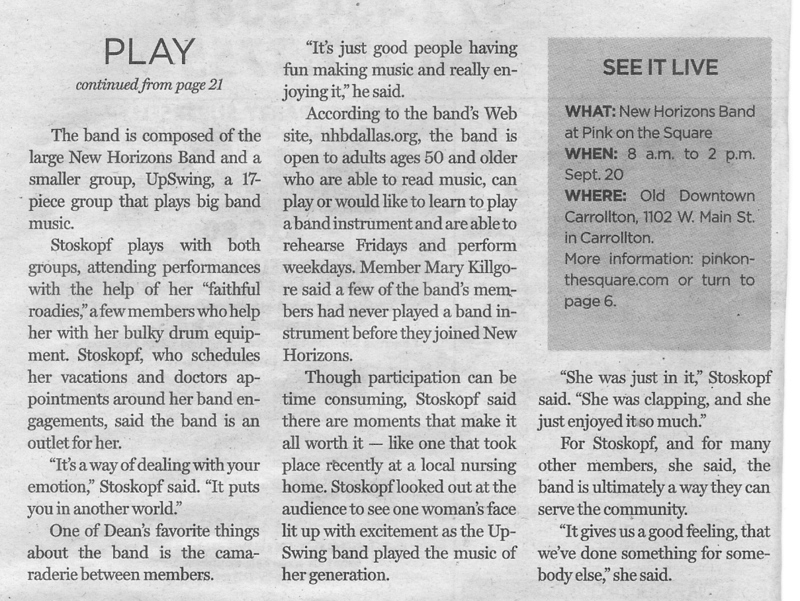 New Horizons Band Dallas is currently 40-members strong, and is constantly growing. No auditions are required to join, and members must be available to rehearse on Fridays and perform on weekdays. The band welcomes members from all over the metroplex. For more information on joining, contact Phil Cook at 972-874-1117. The groups web site is www.nhbdallas.org. Carrollton: Some senior band members hadn't played in 50 years. It's like finding an old friend you haven't seen since high school and picking up the conversation where it left off. Bill Schwartz of Dallas plays flute in the New Horizons Band, which meets at the Carrollton Senior Center on Fridays. Members of the New Horizons Band are rediscovering their passion for music and dusting off instruments many haven't played in 50 years. The band, made up of musicians over 50 years old from all over the Dallas area, meets at the Carrollton Senior Center every Friday afternoon for rehearsals to fine-tune their skills. The 40-member New Horizons Band, which is part of the national organization New Horizons Music Association, includes brass, wind, reed and percussion instruments. The band plays traditional marches, patriotic tunes, collections from Broadway musicals, love songs and popular music. They perform at schools, retirement centers, conventions, hospitals and churches. "We play anywhere people want to hear a band," said Jim Jecker, 71, of Dallas, the president of the concert band, who played trombone in high school but was recruited to play the tuba for New Horizons. "We want to get the word out about the band and encourage membership so we can fill out the instruments. We need more tuba, oboe, bassoon and percussion players," he said. The 12-member Upswing dance band plays rock, swing, jazz and Latin music from the Big Band era. "We pride ourselves in recreating the Big Band sound of the '30s, '40s and '50s, like Glenn Miller, Count Basie and Duke Ellington," said Upswing manager Wes Wilson, 73, of Irving, who plays trumpet for both groups. "I played trumpet back in the old days, and it lay in the closet for about 50 years. I brushed it off and went back to work," Mr. Wilson said. June Stoskopf, a 70-year-old retired guidance counselor who moved to Rowlett two years ago, plays drums for both bands. 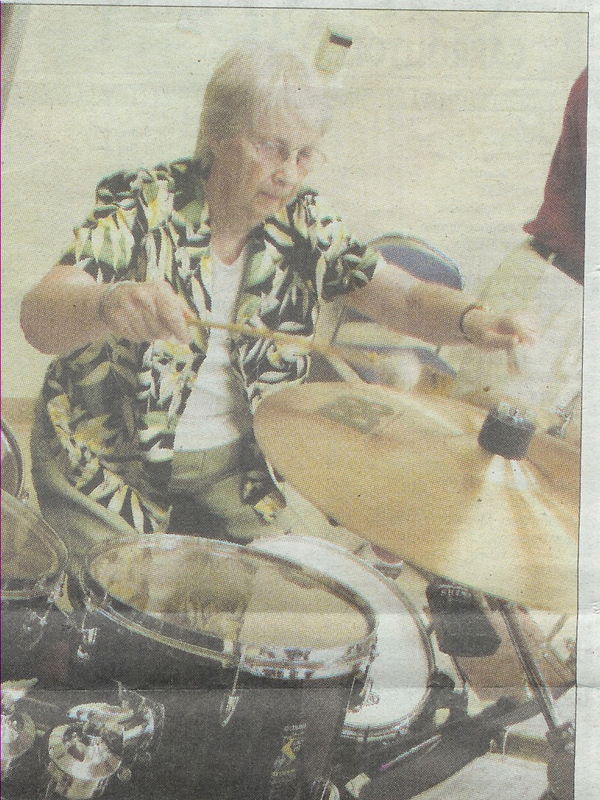 She played the snare drum through high school in the early 1950s and didn't play again until 1999 when she joined the New Horizons Band where she lived in Iowa. "I was kind of scared, but I wanted to do it. It doesn't take long for it to come back to you. It's like riding a bike," Mrs. Stoskopf said. She even had a chance to go back in time, so to speak, when a friend who played bass drum with her in high school visited and sat in on a practice session. "We got her up there with us, and it was like we went back 50 years. I told her, 'Marge, you had your foot cocked out just like you did back then.' It makes all those years just dwindle away," she said. Lynda Stringer is a North Richland Hills-based freelance writer.